Fellow Artists, don’t miss this Apalachicola Oil Painting Workshop Feb 5-7, 8:30 a.m. – 5 p.m. We need at least 8 people to make this happen. 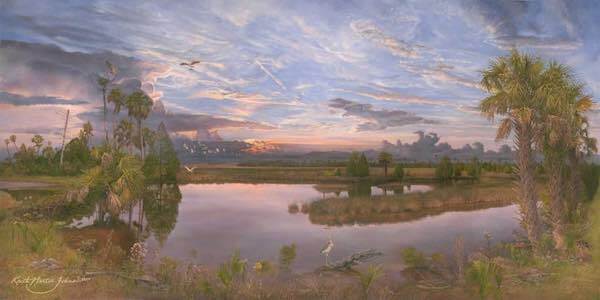 Learn the techniques of Landscape painting from a master Keith Michael Johns coming to Apalachicola Thursday, Friday, & Saturday, Feb 5,6 & 7 at “On the Waterfront Gallery” 117 Market St., downtown. He will demonstrate and guide you through his techniques and secrets for $98 per day or $295 for 3 days. Don’t worry if you don’t have brushes or supplies because he will bring everything. You need only yourself to enjoy and learn from a master. Call 305-588-5885 or 850-653-9699 to register. See you soon! – Lynn Wilson, with AAA. A professional artist for over 35 years and classically trained, Keith Martin Johns is presenting a unique workshop teaching the principles of the Old Masters. He will be an ongoing instructor working with Lynn Wilson at, On the Waterfront Gallery in Apalachicola, FL. Day 0ne: Introduction to fundamental basic vocabulary and color harmony by creating two color wheels and a value scale. Review perspective, movement and balance, grid system, sight readings and negative and positive space. In the afternoon, thumbnail value study in the field. Be prepared to bring your easel and necessities for outdoor sketching on a 18″ x 24″ sketch pad, bring digital a camera and USB cord for downloading. Day Two: Demonstration on how to build, stretch and prepare a canvas. Compose reference materials in an interesting composition. Review chiaroscuro, draw larger value study on paper, and begin underpainting, wash drawing on prepared canvas. To compose art is to see it, feel it and think it. We will do all the necessary study including plein air, sketches and photo reference. Combining imagination to fuel all the inspiration we gather to imitate reality. Keith calls this, “Creative Representation Realism. It’s part real in that it is based upon what we can see and know; that’s the objective nature of art. It’s real in the subjective sense because the stimulus for the art has been processed through the soul. It is no mere picture or exact representation of reality but the reality within and without; that makes it a work of art”. Cost, $295.00 per student, $100 deposit due with registration. Check payable to: Keith Martin Johns. Mail deposit to: 5422 Cliff Street, Graceville, FL 32440 or call (850) 360-4908 for more information. Workshop location: On The Waterfront Gallery, 117 Market Street, Apalachicola, Florida 32320. 850-653-WOWW (9699) or (305) 588-5885. For questions about the workshop call, Linda Johns at (850) 360-4908. See http://www.keithmartinjohns.com/web/pageid/112835/pages.asp for more info.